Note:with use2.0 interface,conected cable,can charger the other digital devices. Built in power bank and the USB port on the side of the case allows you to charge another iPhone. Double your power for double the devices! It is easy to use. This battery case for the iPhone 5 is extremely easy to install and use. A quick button press for turning it on and long press for turning it off. 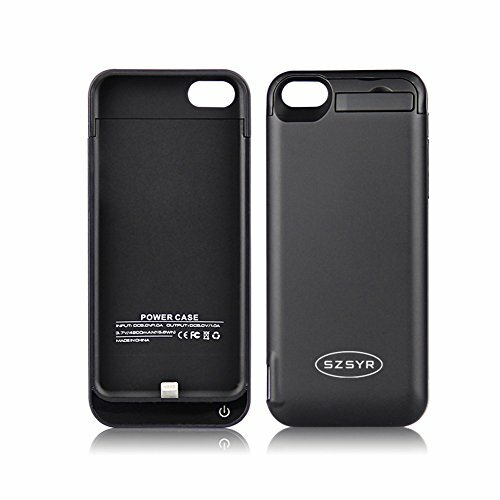 High quality plastic in the battery case for the iPhone 5 makes sure that your phone will be protected from drops and impacts. It provides additional protection for your iPhone 5 against daily scratches and scrapes. Go beyond your power: Increase your battery power with iPhone 5 / 5S / 5C / battery case. It is suitable for the standby power supplies for traveling, tourism, long distance business in car and ships, field work or power outage environments. If you are not 100% satisfied with your new iPhone 5 charger case, just let us know. Contact us via Amazon and we can help with any issues that you may have. If you have any questions about this product by SYR, contact us by completing and submitting the form below. If you are looking for a specif part number, please include it with your message.